Exercise ALPINE SAPPER 18 was the Royal Engineers Annual Race Training Camp and Championships, run over the period of 11th November to 10th December 2018 where sappers compete as individuals and teams for their Regiments. This exercise was designed for all abilities from novice to advanced skiers and provided a bespoke alpine race training package to the Royal Engineers sappers. The three-week training camp culminated in a week of ski race in Slalom and Giant Slalom disciplines. 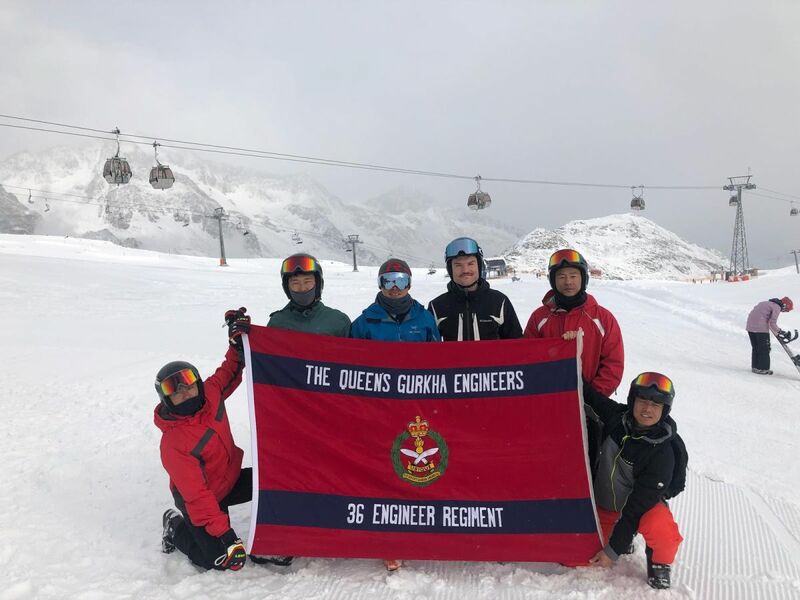 This year six members from 36 Engineer Regiment and the Queen’s Gurkha Engineers attended the exercise. Our team was led by Second Lieutenant Zack Tarrant Taylor and Lance Corporal Sureen Thapa both from 69 Gurkha Field Squadron. Although we had experienced skiers within our team most of them had little or no race experience. The first three weeks were spent practising in Stubai Glacier where race skills were taught and honed. All participants were taught how to ski Slalom and Giant Slalom disciplines, the latter requiring a good dose of courage due to the speeds involved. The Race week involved both individual and team races in Slalom and Giant Slalom Disciplines. The team raced hard and fully committed themselves to what can be a daunting challenge when stood in the starting gates at the top of a steep run. Unlucky falls in the Slalom and Giant Slalom team events meant we finished 6th in Slalom and 8th in Giant Slalom from the 18 teams competing. Our best individual finisher was Sapper Bijay Sherpa who finished the 10th position out of 73 strong competitors across the Corps of Royal Engineers. With the same effort and commitment next year I am sure we will be pushing for podium positions. Well done and many congratulations to all.